She can play wrestle with chimpanzee friends and groom in the comfort of a safe home, and she can explore her expansive open-air enclosure and feel the sun over her—something she likely hasn’t felt since she herself was a baby in the forests of Africa. We are continuing with our chimpanzee profiles leading up to Give Five Day and the five-year anniversary of the chimpanzees’ arrival to sanctuary on June 13th. Today we feature Jody. Jody has a unique personality. She’s very serious and independent, but also caring and kind, and will happily greet her caregivers every morning. 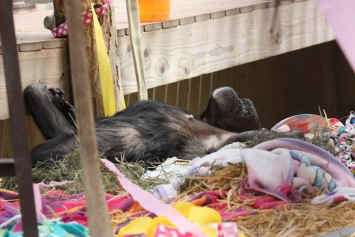 She loves to lounge around in the afternoon in the warm greenhouse, and builds the most fantastic nests. Seeing Jody nest is really fascinating. She is very diligent in the process—she seems to take it pretty seriously and sometimes she will have very elaborate nests. Lately, she’s been interested in nesting with the bamboo we planted in the greenhouse. Jody was a little timid to go out on Young’s Hill at first, but after some encouragement she became fearless and will spend a long time out there—sometimes she is hiding behind structures and we have trouble finding her! She is also very helpful. She will sometimes pull blankets out of doors when we ask nicely so that we can close them, and she will also “round up” stragglers at meal times, to get them to come out to the greenhouse for breakfast. 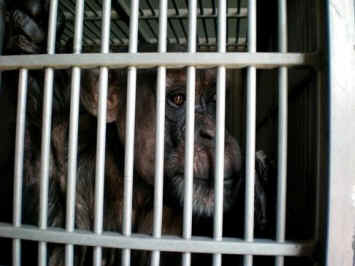 Over the next year and a half, Jody was regularly transferred between cages. Sometimes she was with another female, sometimes by herself, but usually she was with a male for breeding purposes—Max, Mack, John, Magoo, and others all in an attempt to create the next generation of lab chimpanzees. 1/4/83 – 4cc Ketaset IM. Delivered infant baby male – taken away to nursery… Baby – Male WSRC #66 OPY – appears healthy. Jody never got to nurse Opy, or hold him, or carry him on her back, or teach him about the world. She was immediately knocked down with ketamine (a.k.a. Ketaset) and her baby was stolen. The “IM” in these notes stands for “intramuscular” meaning she—like all the other mothers—was being stabbed with syringes or shot with darts. 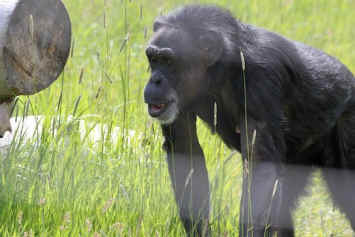 Six weeks after delivering and losing her first baby, Jody was put into a cage with a male named Rufus for breeding, and the cycle continued. She would go on to have eight other babies—Levi, April, Cliff, Clay, Adam, Andrea, Bart, and Taylor—as well as two miscarriages in just ten years. 11/23/83 – 4cc Ketaset IM. Delivered healthy infant male #88… removed and taken to nursery (Levi). 6/20/84 – Found approx. 2-month old fetus + placenta in cage this a.m.
4/26/85 – Delivered healthy looking baby at 10:30pm… 3cc Ketaset IM. Not taking care of baby. Infant removed to nursery (#119 April). Animal does not appear to be feeling well. Did not eat any fruit this date. 3/15/86 – Delivered healthy infant early a.m. this date. 3 1/2 cc Ketaset IM. Mother was leaving infant on the floor – infant removed + taken to nursery. Appears to be a healthy animal #142 Cliff, male. 5/20/87 – Delivered healthy male infant between 11:30 and 12:00 pm… 5cc Ketaset IM. Infant male #162 Clay removed and taken to nursery, Mother leaving infant unattended. 1/4/89 – Arrived for night checks at 10:15pm… found infant alive in cage no more than one hour old – mother not taking good care of infant. 4 1/2 cc Ketaset IM. Removed infant male #0187 – appeared healthy. 9/30/90 – Delivered healthy infant female approx. 4 to 6 a.m. this date. Mother not taking good care of infant- leaving infant on floor unattended. 4 1/2 cc Vetalar IM, infant removed to nursery (#215 Andrea). 1/14/92 – Delivered healthy male at approx. 2:50pm this date. Mother not taking good care of baby. Leaving baby on floor unattended. 4.5 cc Vetalar IM Infant removed at 4:05pm, taken to nursery. Drew milk out for baby. (#226 Bart). 2/19/93 – Delivered infant early a.m. this date. 0515 hrs found infant on cage floor. Infant very cold. Removed infant immediately to nursery, mother not caring for infant. Infant male #236 Taylor. Jody had the potential to be a great mother, but after being stolen from her own mother and forced to live in a lab, where baby after baby were taken from her, she was not attending to her infants the way she would have in a more natural environment. It really isn’t at all surprising that Jody wouldn’t create a bond with her infants when she had never had one with her own mother. She deserved to be raised with her mother and to learn what it is like to be loved unconditionally, and she deserved the chance to show her own children the same love. We sadly can’t make everything right again, and we can’t undo what’s been done. But what we can do is honor Jody and make every day more interesting and more exciting than the last. Now she can build elaborate nests with blankets and paper and bamboo shoots if that’s what she prefers, she can play wrestle with chimpanzee friends and groom in the comfort of a safe home, and she can explore her expansive open-air enclosure and feel the sun over her—something she likely hasn’t felt since she herself was a baby in the forests of Africa. For five years Jody has been in sanctuary, free from all the horrors of the lab.